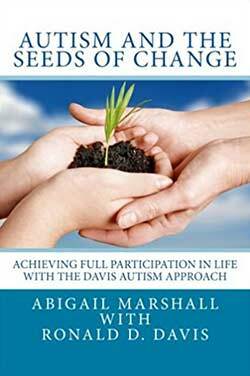 Achieving Full Participation in Life with the Davis Autism Approach. Book by Abigail Marshall and Ronald D. Davis. Review by Cathy Dodge Smith, Ed. D.
Abigail Marshall and Ron Davis have written a wonderful book that is a must-read for anyone looking for a fresh approach to the understanding and treatment of autism. It is not a how-to guide, but rather a guide to understanding what the Davis Autism Approach® Program is all about. The Davis approach to helping autistic individuals participate fully in life comes from Ron Davis’ own experience. He was labelled a “Kanner’s baby” in infancy, and declared to be uneducably mentally retarded at age 12. Yet, he is now recognized as an educator, author, and creator of several break-through interventions including the Davis Dyslexia Correction® Program, the Davis Attention Mastery® Program, and now the Davis Autism Approach Program. Just as he journeyed out of the void of autism, he has now given us the means to assist others make that same journey. As with all Ron Davis’ work, the autism program is built on a new way of understanding the underlying cause of autism. He sees it not as a genetic flaw or a neurological problem, but as the result of impairment in integration. In this paradigm, autistic individuals do not perceive the world as non-autistic people do, and therefore do not take from their experiences what neurotypical people would. This in turn leads to understandings, thoughts, and behaviours that do not serve the autistic individual in his attempts to live in the real world and relate to the people in that world. The main difference in the Davis approach lies in the distinction between teaching behaviour and facilitating identity development. Davis Facilitators, people trained to use Davis methods, draw autistic individuals along through three distinct phases of development. In the first phase, orientation, the autistic individual is taught a procedure that allows his perceptions to be accurate. Feeling overwhelmed is a common phenomenon in the autistic world. Orientation allows autistic individuals to begin perceiving the world as it really is, so that many of the things that were once overwhelming, such as sights, sounds, and tactile stimulations, no longer cause those feelings of confusion and distress that lead to the experience of being overwhelmed. In the second phase, identity development, the autistic individual is gently led through a series of experiences that allow her to learn about the world and her place in it. It is as if she were given the opportunity to start over and learn about the world through “normal” experiences, rather than through the perceptually inaccurate filter she had used the first time around. In this way she quickly (relatively speaking) has the opportunity to go through the stages of development missed the first time around, developing new understandings, thoughts and behaviours. The third phase, social integration, assists the autistic individual to learn about relationships: how they work, and why they are important. While no behaviours are taught, behaviours change significantly as the individual grows and literally becomes a different person, one who is able to exit what Ron Davis refers to as the void of autism, and join his fellow human beings in the dance of life; to participate fully in life. Abigail Marshall has captured the essence of this journey exquisitely. Her ability to make the complex simple and clear is in full evidence. With the brilliance of Ron’s insights, and the clarity of Abigail’s writing, the reader is able to understand the underlying principles of this new approach to autism, and also grasp the reason why the methods work so unerringly to allow others to follow in Ron’s footsteps. The book explores the ties between the Davis discoveries and emerging scientific research into autism. Many case studies and examples bring the process to life. After reading this book, adults with Asperger’s Syndrome and parents of autistic children will have the information they need to decide if this approach is one they want to explore for themselves or their loved ones. Professionals will have the information they need to help them decide whether they want to look further into this unique perspective into autism. I believe everyone who reads Autism and the Seeds of Change will see autism differently, and will emerge with an exhilarating sense of real hope.